The secret to excellent tomato sauce? According to F&W’s Grace Parisi, the trick is starting with superlative whole (not crushed) tomatoes and simmering them with whole (not chopped) garlic cloves. The result: A classic marinara that can quickly be spun into all sorts of variations. This spicy, pancetta-studded sauce is great with shellfish and bucatini, the hollow, spaghetti-like pasta. Slice 3 ounces pancetta 1/4 inch thick, then cut the slices into 1/4-inch dice. Sauté the diced pancetta and 1/2 teaspoon crushed red pepper with the garlic. 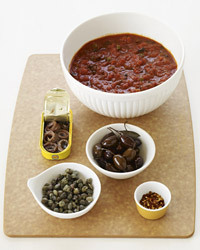 The combination of anchovies, olives and capers gives this napoletana sauce a robust flavor. Sauté 6 anchovy fillets and 1/4 teaspoon crushed red pepper with the garlic; add 1/4 cup chopped kalamata olives and 2 tablespoons drained capers with the basil. Vodka adds a spicy flavor to this popular Italian American sauce. Sauté 2 ounces diced pancetta and 1/4 teaspoon crushed red pepper with the garlic; deglaze with 1/4 cup vodka; stir in 1/4 cup heavy cream after discarding the basil and garlic and simmer for 5 minutes.